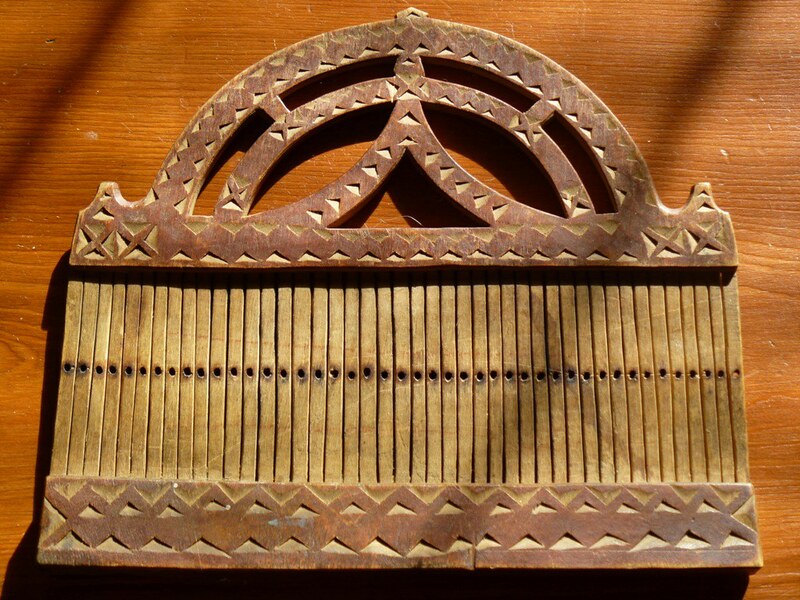 This cute little wooden frame loom jumped into my hands this weekend. How could I pass it up? It was only $3. However, once I warped it and started a tiny project–the loom measures just 6″ x 7″–I found it less than cute to use. 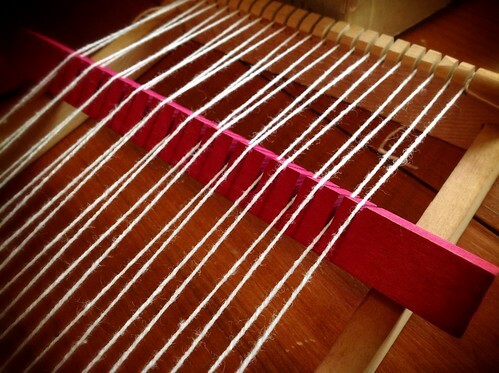 The warp strands need to be very tight or the heddle, which rocks back and forth to create a shed, slips right off. It’s very tiny but not as useable as one would hope. 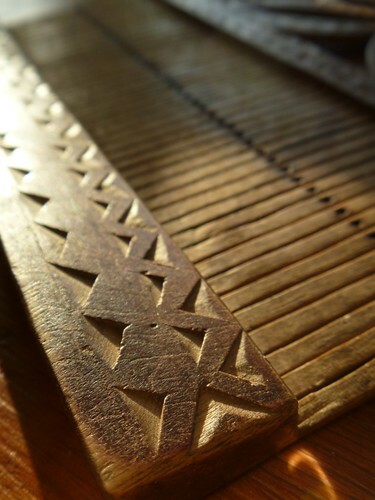 I used the Peacock loom again as a frame and the 10 dent Beka heddle to weave another Sami patterned band. 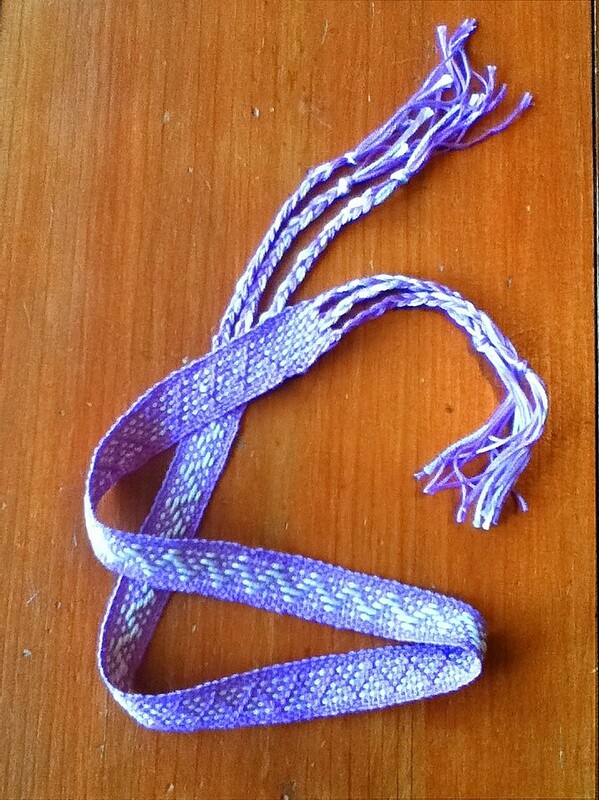 The lilac color is embroidery thread and the white is Cascade Ultra Pima Cotton. I couldn't make heads or tails of the pattern until I realized the pattern strands (which are in the center and double the thickness of the other strands) are sometimes raised from beneath, and sometimes lowered from above. 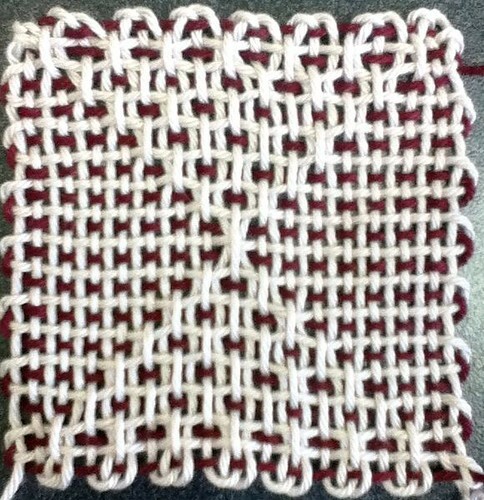 This may not make any sense, but once I figured it out, I knew how to do this style of weaving. There are some really wonderful band weaving heddles out there with fancy double holes and smaller slots, but if you want to try it, I suggest using a simple rigid heddle and a pattern. You don't even need the loom, as traditional weavers do this backstrap-style. If you'd like a place to start, I suggest you try The Braids and Bands Yahoo group. It's free but you do need to join. Try the Files section to find a series of PDF handouts by Susan Foulkes, who recently held an online course for Sami style band weaving. Now that I've got the hang of it, I want to use a finer thread, more colors, and a more intricate pattern. I pulled out one of my old Weave-Its and followed the instructions in the 1945 “Weave-It Weaves” booklet to weave the hourglass pattern. In this case, I used an off-white cotton for three sides and swapped to maroon for the third. Now I want to do weave all the patterns. This is as far as I sampled Krokbragd on the Wonder Weave. I didn't want to stress the old plastic, and I was just learning the basics. Now I'm going to try a larger sample on the Kessenich two harness table loom. While walking through an antique store a few weeks ago, another loom jumped into my hands, this time a 25″ Erica rigid heddle loom. It’s in perfect condition and works like a charm. I’ll post pictures of my first project soon. Handweaving: Digital archives for handweaving history. Just look at the goodies found when the keywords rigid heddle and two harness weaving are used. PDFs and free… It's great! Posted on November 10, 2010 Categories Tutorials, Vintage, WeavingTags cape, digital archives, poncho, rigid heddle, weavingLeave a comment on Handweaving.net and Ponchos! I wove a narrow sample of the log cabin pattern on my rigid heddle loom. It's long enough to become a strap for a bag or purse, or trim on something like a bag or a purse. Because I used two similar colors, green and blue, the pattern doesn't stand out clearly but I still like it. To do a log cabin pattern, you simply need to warp the colors in the correct order, followed by using the same pattern in the weft. For example, on this small strap I did BGBGBG and then GBGBGB (repeat). Again, the weft follows the same number and color, BGBGBG followed by GBGBGB. Easy! I'd love to do a wider project. And then there's this sad Weave-It loom. Marked a dollar, I couldn't pass it up. I wondered if I should try to glue it but then decided that I already have three of the 4" squares, so for a dollar, it can be my spare peg loom in case I ever need parts. Spool knitters have been around for ages. Also known as French knitting, when a strand of yarn is looped around the pegs, eventually a length of knitted cord appears. I've had a few spool knitters, or "Knitting Nancies," but only in the plastic Knifty Knitter variety. When I found my vintage Nancy at an antique shop a week ago, I decided to investigate them. Lo and behold, I discovered an entire blog on them, with information about the history, different makers, and projects, as well as modern uses. Please visit Spool Knitter, the blog, and get your fill of everything related to these tiny knitters. This old Knitting Nancy spool knitter was at an antique store, waiting to come home with me. The tag said Made in England. She's worn out but still usable, assuming I keep her safe from the cats. 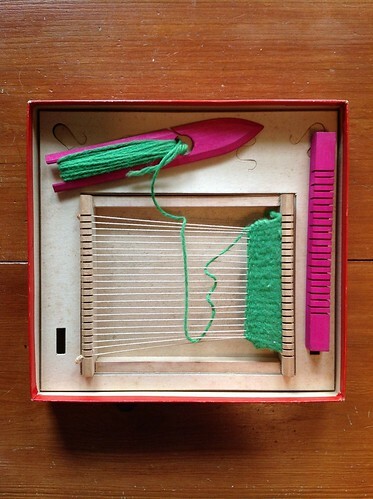 The Weave-It Rug Loom is one of my favorite little looms. Awhile back, I was lucky enough to find this one at an antique store along with a plastic 4" Weave-It. 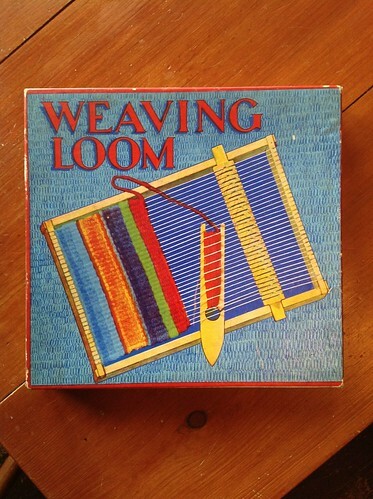 The Rug Loom is a little bigger at 5" square and it has fewer pegs, but you wrap it exactly the same as the smaller loom. It was meant for using bulky, or a "rug" weight of yarn, and most of the patterns I've seen from the old booklets are for afghans or stuffed toys. I like my Weave-It Rug Loom so much that I had to make a video. Hope you enjoy it!